I understand Jump recently re-opened and the redecorated space is gorgeous. Upon entering the restaurant you approach the Hostess station and are standing aside a floor-to-ceiling whisky-bottled adorned wall. To the right is a bar area with tables and beyond the station is the dining area. The main area is airy and the tables are separated for private conversation, whether at one of the rectangular tables or at one of the banquettes. I found the noise level moderate with 35% occupancy, but could still hear my colleagues. The staff was very friendly and efficient but I would warn people that they really upsell the in-house water which is $2.50 per person. It was well worth the price for me, but just be aware that it is not free. The corkage is also $25 per bottle on a BYOB, again just a head’s up. Not being a native I am not sure if this is customary in Toronto. I ordered a half order of “Truffle Ricotta Gnocchi” with Northern Woods wild mushrooms and porcini cream to start and the “Miso-Glazed Black Cod” with stir-fried mustard greens, jasmine and black rice for my entrée. The Gnocchi included four 1-inch long cylinder shaped gnocchi, topped with an assortment of mushroom sections (from Northern Wood) in a porcini cream sauce. 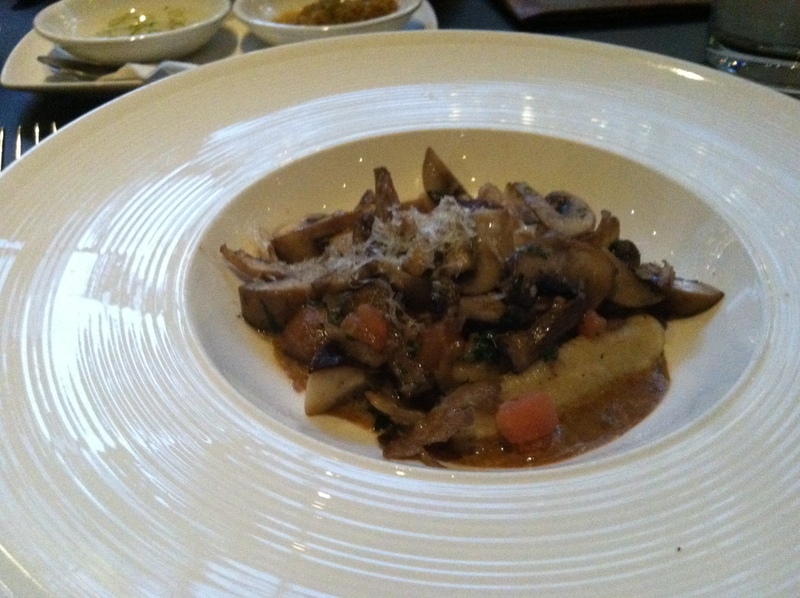 The gnocchi were fair at best, very dense, with very little flavor and there was little, if any, seasoning. The mushrooms were more pedestrian than wild, unless you define quartered cremini, which comprised most of them, as wild. But the sauce was delightful, a deep rich earthy sauce. At first glance I was disappointed in the size but after I finished I was glad I did not waste the calories. Unless they change the recipe for the gnocchi I would go for a different appetizer. The miso glazed Black cod with mustard greens was a picture perfect presentation, but the flavors were all over the spectrum, from non-existent to spicy. 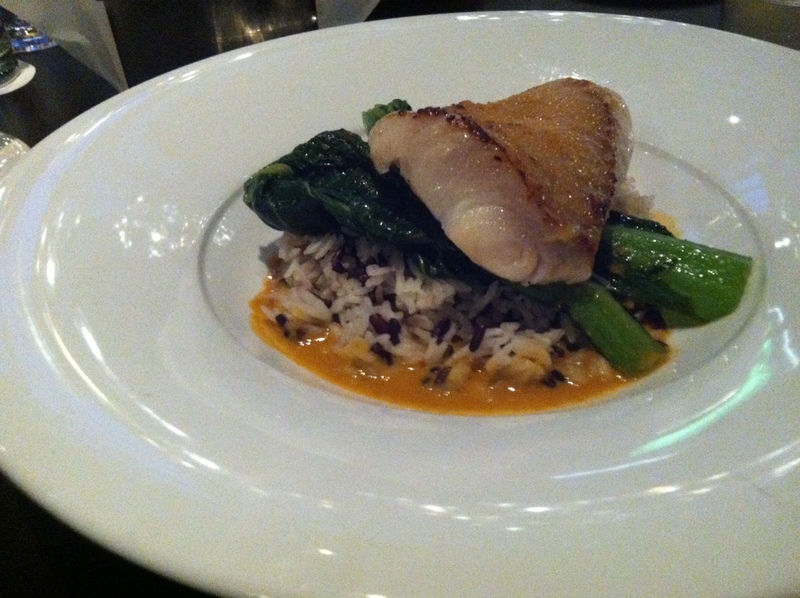 The fish was perfectly cooked and was moist as expected in a fatty cut of fish. The miso glaze was very uneven with certain bites delicious and others with no flavor. The mustard greens were nicely prepared but did not have that slightly bitter-y quality I was looking for. Both of these components sat atop a rice pilaf, which was about as flavorless as possible. It was akin to basic boiled rice. These were all nestled in a red sauce that had a good kick. Overall I did not like this dish and would recommend going in a different direction…it has potential but needs a little TLC from the kitchen. Overall I was pleased with the environment but disappointed in the food. It has a lot of potential with the design of the menu but execution needs to catch up.